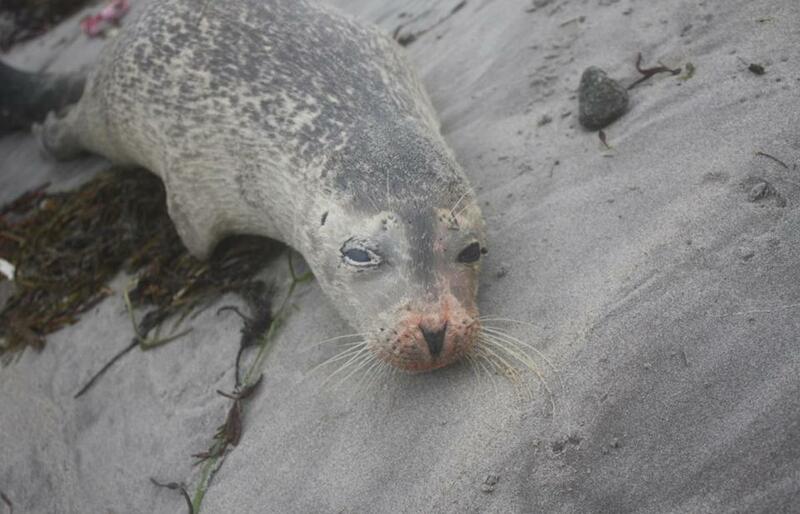 Dead harbor seals were seen on New Hampshire beaches earlier this year. A flu virus similar to one found in birds but not previously detected in harbor seals was the cause of five of 162 recent deaths of the marine animals off the New England coast, federal and state officials said yesterday. The influenza virus, known as H3N8, appears to have a low risk for transmission to humans, they said. But officials are urging the public to be cautious about approaching stranded seals to reduce the potential risk of spreading the infection to people or their unleashed dogs. “Influenza that poses a risk to people are human strains of influenza. . . . but there have been documented cases in people of transmission from other species,’’ said Dr. Catherine M. Brown, public health veterinarian for the Massachusetts Department of Public Health. Other viruses that caused global disease outbreaks in years past, such as avian and swine flu, jumped from birds and pigs to humans, usually through the animals’ caretakers, Brown said. She said there has been an increasing number of instances in the past decade of flu viruses jumping from one species to another. Federal scientists have been working with researchers from the New England Aquarium and various centers around the country to investigate the string of seal deaths since September along coastline stretching from Massachusetts to Maine. Young harbor seals accounted for most of the deaths, which were coming at a pace roughly three to four times the normal number in September and October, said Dr. Charles Innis, the aquarium’s chief veterinarian. The death rate has slowed since late November. The specialists said in a press conference that they believe the influenza type A virus that infected the seals left them vulnerable to a bacterial pneumonia that killed five of them, all off New Hampshire’s coast. They said that land-based animals, such as wild birds, that were infected suffered upper respiratory infections, and most recovered. “We don’t understand at the moment what is making this virus more deadly,’’ said Dr. Hon Ip, a researcher at the US Geological Survey Wildlife Health Center. Ip said earlier deaths of seals have been traced to an influenza virus but that they were few and far between since the 1970s. The scientists said they will continue to study the strandings and to test tissue samples taken from some of the dead seals to determine how many others may have been infected by the virus. So far, only harbor seals appear to have been affected, but the scientists said they will be investigating whether the virus has infected gray seals and harp seals, and they will be working with scientists in Canada to monitor the health of harbor seals in Canadian waters. Some studies have indicated that certain contaminants can adversely affect marine mammals, such as polychlorinated biphenyls, or PCBs, a lubricant banned in the United States in the 1970s because of evidence it harmed fish and other wildlife. The substance is slow to break down and persists in the environment. Rowles, the NOAA fisheries coordinator, said researchers have not seen any signs of a spike in PCB levels in the dead seals they have studied so far.